Invest your time, resources or finances into changing somebody’s life! Joan Kadalie – We Salute you! Please note that the memorial service of Rina Koopman will be held this Sunday, 2oth Sept. 2015, at 3:30pm at the Bethel Bible College in Crawford. What does a transformed city look like? 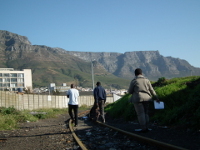 Field workers follow the train tracks to take the message of the Kingdom through every crack and crevice of our fractured city. More to enjoy and rejoice about. And so we ended the first stage of our business startup program for young men and women who need a way out of negative lifestyles and income streams. In short they learned how to make money with R100 and how to manage money in very practical ways. Thanks to Chris Black and Dynamic Business Startup for taking on our particular target group as a first in your 25 year history. Thanks to Community Chest, and Mitchel Du Plessis and Associates for partneting with us to make this happen. Our guys picked him up at the airport and they clicked immediately. City Mission welcomes Johnny Pickup. He is a photojournalist from London UK who has come to chronicle the stories of transformation in this, City Mission's 116th year. It is his first visit to Cape Town but he asked not to liveto live in a hotel but to live in our flat for ex offenders and stay with our amazing young men for the 7 days he is with us. He was happy to sleep on a couch or on the floor but Sibu insisted to give up is bed. Last night Marlon was on supper duty and Johnny was introduced to gatsby's! And the stories started. The basis of real change in society is that of spiritual transformation.